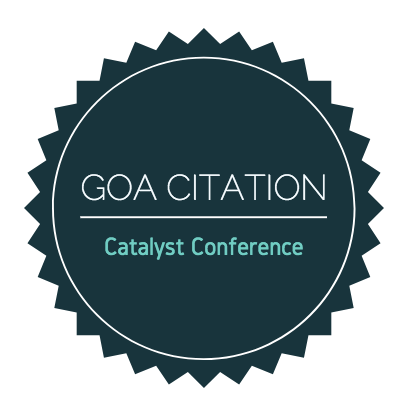 GOA Catalyst Conference » Urban Blight Or Urban White? Urban Blight Or Urban White? Having lived in both New York City and the Bay Area my entire life, I have always had an intense fascination with cities and transportation. When I was a child, I loved to draw layouts for imaginary towns; I created water slides that went out of buildings, buses that looked like dragons, and plans for tools I thought could help the world. Construction paper renditions of ‘oil collectors’ and super fast trains often filled our family’s bookshelves. My mom has worked in transportation in urban areas for her entire life, having grown up in New York after the reign of public planners like Robert Moses and his many prejudiced ventures, and I have always been intrigued with the intricacies of her work. Urban areas are so intriguing to me, in fact, that last year I based my I-Search on the future of cities. Yet, it was on my recent annual trip back to New York City where I realized that the real truth lies in their pasts. Traveling on a Parkway towards Long Island, my family and I passed under an arched bridge, hanging so low that I could almost touch it. I thought nothing of it. However, this plain gray bridge, as my mother soon told me, wasn’t just any run-of-the-mill arched bridge. Robert Moses was a prolific urban planner in New York City during the 20th century. Unfortunately, one of his projects included the infamous and tragically beautiful Southern State Parkway, one of the first highways connecting New York City to numerous towns and beaches along Long Island, and one of the first examples of the modern highway (Campanella). During the construction of the parkway in 1927 Moses intentionally created arched stone overpasses to prevent buses, mostly coming from lower income and predominantly black communities, from using it (Kolitz). Said Moses, “Legislation can always be changed. It’s very hard to tear down a bridge once it’s up” (Budds). Unfortunately, he was right. After 90 years, these bridges still stand between poor minority neighborhoods and the Long Island beaches he so greatly wanted to keep all white; despite the fact that the general requirement for bridge height is twelve feet, the overpasses on the parkway are a mere seven to eight feet (Kolitz). Moses was profoundly and undeniably racist. He even went out of his way to clog black neighborhoods with cars, placing parkway off-ramps in less than ideal locations to keep wealthier neighborhoods untouched by traffic (Kolitz). 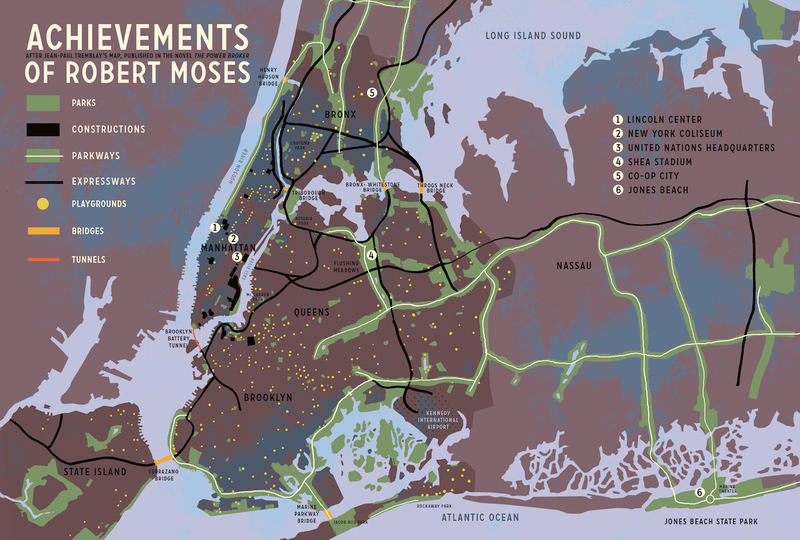 Though his many projects helped shape the New York of today, Moses set a negative precedent for all American city planners, highway engineers, and politicians to come by designing with wealthy, predominantly white interests in mind. As the 20th century wore on, urbanism evolved. In the 1939 world’s fair, General Motors exhibited “Futurama,” a scaled model for the city of the future, depicting tall skyscrapers completely surrounded by raised highways and ‘state of the art’ car factories (Simek). By 1940, 60 percent of Americans owned cars, and the pressure from the auto industry to create highways for cars was more powerful than ever (Semuels). In 1959, President Eisenhower signed the Federal-Aid Highway Act, which covered 90 percent of the cost for any highway built in the U.S. City planners rushed to build highways, for now they could build efficient roads from their newly booming suburbs straight through their cities for almost no cost (Simek). During the 50s, 60s, and 70s, interstate highways attracted $425 billion in investment, and were extended 48,000 miles (Stromberg). However, this infrastructure was geared towards middle to upper-class white people. It greatly marginalized minority communities in inner cities, as highway engineers saw their coveted super-roads as an opportunity for what they called “urban renewal” (Simek). The white engineers intentionally demolished minority communities to make way for these highways, building the colossal structures over bulldozed homes, businesses, and lives, just like they never existed. To them, it was a perfect two for one; follow an inner-city highway in practically any city today and you will be walking on the burial ground of historically Black, Latino, or Asian communities. Highways, as one former highway engineer conceded in a 1972 interview, were “a good opportunity to get rid of the local n***ertown” (Erickson). While rich white people moved to the suburbs and started commuting using the highways, Black communities were completely destroyed, their residents having almost nowhere to go. Detroit, 1950 to today. Click on this picture to look at other cities. In Detroit, Michigan, for example, Black Bottom and Paradise Valley, two historically black neighborhoods, were completely wiped out to make way for I-375, displacing thousands of people to either federal housing projects located outside the city or other black neighborhoods (Simek). Black Bottom, with 350 successful black-owned businesses, was decimated; the I-375 was built down Hastings Street, the neighborhood’s main artery (Jouppi). Businesses that weren’t blighted by the highway were destroyed by the lack of local and foot traffic, and the area’s economy plummeted. The crime rates rose in neighboring communities with the influx of Black Bottom and Paradise Valley residents, and overpopulation became a huge problem (Jouppi). By the end of the 20th century, it was painfully clear that urban “renewal” was just a codeword for white America’s racist infrastructure. Yet the Supreme Court, when faced with cases like Berman v. Parker, in which the plaintiff tried to protect their business from being destroyed by the government so that the area would “look nicer,” continuously upheld it under eminent domain (Budds). Following Robert Moses’ precedent, American transportation infrastructure destroyed already disenfranchised and physically marginalized communities, keeping entire minority groups impoverished and invisible. Like Detroit, Oakland, California also faced an uphill battle against racism in urban planning. 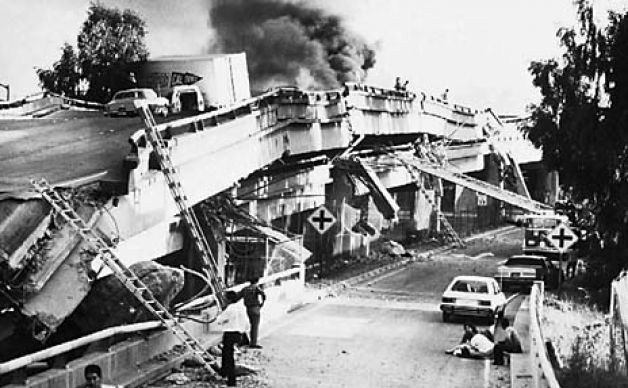 In October 1989, the 15 second Loma Prieta earthquake shook the Bay Area to its core, destroying a section of a freeway called The Cypress Structure. Existing for 32 years, the structure’s presence nullified nearly 30 city blocks. It cut off West Oakland from the rest of the city, as a 1993 newspaper wrote, “like a Berlin wall” (Jones). When it was built, the structure caused 3200 residents and merchants to gradually leave the once thriving black community, which thus damaged any of the other businesses still left (Jones). The freeway was not just a “geographical barrier, but a sociological barrier,” said Reverend Warner Brown, pastor of a church just east of the highway (Schmich). Despite the completely negative effect this freeway had on the community, the state still allocated 700 million dollars to rebuild the Cypress Structure exactly where it had been (Jones). Shocked, the community protested, and in 1991 the state changed rebuilding plans, and opted instead to build the missing portion farther west along the industrial shoreline (Adamson). At the end of the day, freeways are disruptors. So, when the debris was cleared from where that “Berlin wall” used to be, Oakland rejoiced; though only for a short time, they were whole. 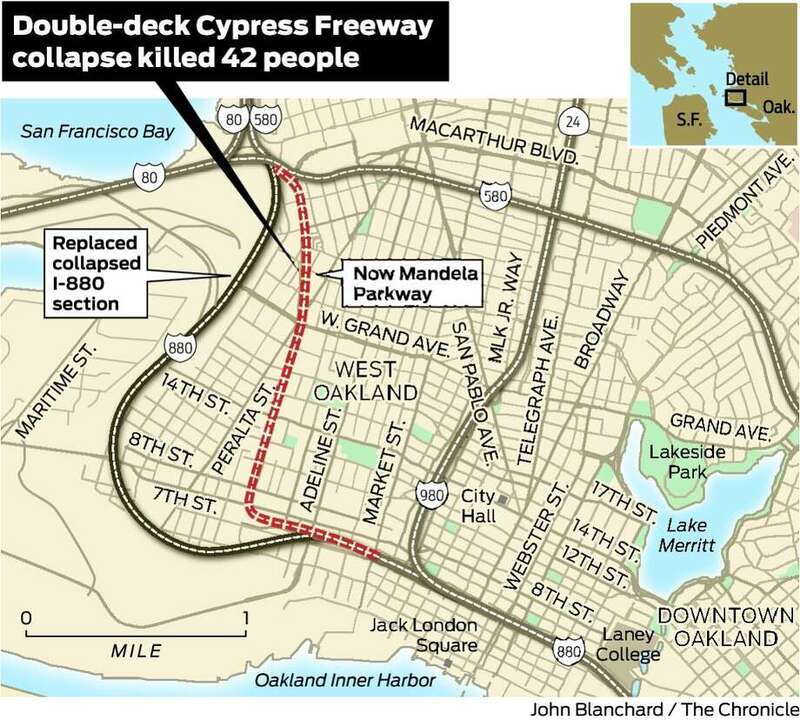 It was a triumph to prevent the government from rebuilding the Cypress Expressway in the same place, but West Oakland and other majority Black parts of the city are still covered in freeways. Not only have these freeways historically displaced minority people in our city and all over America, but the air pollution they cause continues to harm these poorer parts of our communities. West Oakland, with a majority Black population of 20,000 residents, is completely surrounded by highways, and East Oakland, impoverished and majority Latino, has three highways surrounding its houses and businesses. In both of these areas, for every 10,000 hospital visits, 130 are due to asthma, more than three times the state average of 48. An African American or Latino citizen living in West Oakland can expect to die 15 years earlier than a White person from the Oakland hills, all because of highways that, as data shows, local people of color don’t use nearly as much as White people from the hills and suburbs (Schell). According to a 2013 U.S. Census, while 15.9 percent of Black people and 9.1 percent of Latino people don’t own or use a car, that number is just 5 percent for White people (Ramey). The truth is, white people are not only oppressing minorities. We are killing them. Though the racism surrounding transportation infrastructure seems like a daunting and unsolvable issue, there are solutions out there. First of all, no policy change can completely reverse the long-lasting effects of white urban renewal using highways. However, by increasing diversity and education in urban planning while including public opinion in every project in the city, Americans can prevent such racism from ever happening again. According to Justin Moore, an architecture professor at Columbia University, it still remains the case today that “the majority of the people who plan, design, and build our communities and cities lack the diversity of those same communities and cities” (Budds). The problem during the 20th century was that all of the engineers and people in power had free reign to do whatever they wanted, in a very undemocratic way. Yet, with the population of cities having a say in what they need and who gets to design it, there will never be highways built intentionally through minority neighborhoods again. As I mentioned before, pollution in highways continues to affect these neighborhoods today. By increasing public transportation, the number of cars on highways could eventually die down. Mix that with the prominence of electric cars in cities, and pollution could be virtually gone. And, when the highways aren’t being used anymore, they can be turned into public spaces. 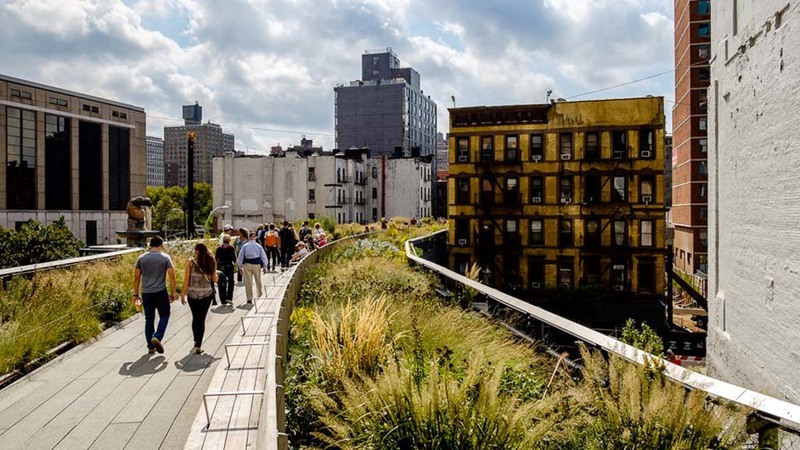 Take New York City’s “High Line”. Once an old elevated freight car platform that ran through the city’s west side, the high line is now a public walkway redecorated with stunning flora. Almost one and a half miles long (From Chicago…), this once public nuisance has been turned into something beautiful that nurtures community, instead of dividing it. Transportation infrastructure was once a tool for hatred and racism. But, with technology and democracy, that can all change. Adamson, Christopher. “Dislocation or Destruction – On Freeways in Oakland.” Entropy Magazine, www.entropymag.org/dislocation-or-destruction-on-freeways/. Budds, Diana. “How Urban Design Perpetuates Racial Inequality–And What We Can Do About It.” Co.Design, Co.Design, 13 Sept. 2017, www.fastcodesign.com/3061873/how-urban-design-perpetuates-racial-inequality-and-what-we-can-do-about-it. Campanella, Thomas. “The True Measure of Robert Moses (and His Racist Bridges).” City Lab, 9 July 2017, www.citylab.com/transportation/2017/07/how-low-did-he-go/533019/. Erickson, Ericka. “Does the Marin Transportation System Shut Out People of Color?”Reimagine, Reimagine, www.reimaginerpe.org/node/2813. Jones, Arthur. “Put no freeway in my backyard.” National Catholic Reporter, 26 Mar. 1993, p. 5. U.S. History in Context, http://link.galegroup.com/apps/doc/A13609874/UHIC?u=headroyces&xid=561cd126. Accessed 31 Jan. 2018. Kolitz, Daniel. “The Lingering Effects of NYC’s Racist City Planning.” Hopes & Fears, 16 Dec. 2015, www.hopesandfears.com/hopes/now/politics/216905-the-lingering-effects-of-nyc-racist-city-planning. Ramey, Corinne. “How America’s Transportation System Discriminates Against the Most Vulnerable.” Slate Magazine, 26 Feb. 2015, www.slate.com/articles/news_and_politics/politics/2015/02/america_s_transportation_system_discriminates_against_minorities_and_poor.html. Schmich, Mary T. “Buckled Freeway Gone, Few Want It Back.” Chicago Tribune, Feb. 1990, search.proquest.com/docview/282778188/fulltext/6E475BD5290C447FPQ/3?accountid=39972. Semuels, Alana. “The Role of Highways in American Poverty.” The Atlantic, Atlantic Media Company, 18 Mar. 2016, www.theatlantic.com/business/archive/2016/03/role-of-highways-in-american-poverty/474282/. Stromberg, Joseph. “Highways Gutted American Cities. So Why Did They Build Them?” Vox, Vox, 14 May 2015, www.vox.com/2015/5/14/8605917/highways-interstate-cities-history. I really enjoyed reading through your project. I knew a little about how infrastructure was used in Oakland to create segregation, but I did not realize the extent of the problem. This is a great project. Going to Head-Royce, I knew that there were differences in pollution based on elevation, but I never knew it was the highways that caused this and that this was an intentional choice by racist planners! This definitely informed me about another form of racism that exists but is never talked about. I think this is a wonderful project! I love the personal story in the introduction. It really grabs my attention! Interesting and provocative article, addressing the urban racist blight caused by earlier planners and ending on the high note of the High Line.